Low carb, keto approved Chili is the best! 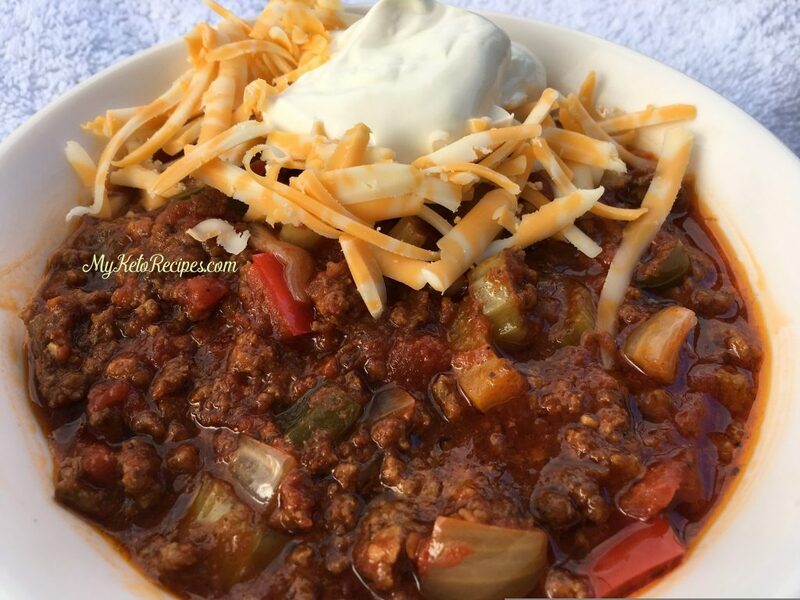 My kids loved this recipe because they really like chili with no beans! Great to feed a crowd, this is a winner! 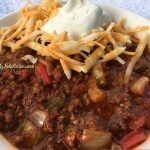 Chili is so good, especially this time of year when it’s cold outside and you need something hearty and filling to warm you up! Traditionally, chili is high in carbs because of the beans in it. I’m not a big fan of beans so I definitely prefer keto chili! It’s nice and thick and delicious! My kids loved this because they aren’t fond of beans either. I made Keto Bread to go with this and my kids actually dipped their bread into the chili. YUMMY! I toasted some of the bread in the frying pan and it went so well with the chili. Next time I think I will use garlic butter. Who knew you could enjoy bread and chili on a low carb diet? You can when it’s a keto approved recipe! Chili is great for a crowd. You can easily double the recipe to make extra. Another great reason to make extra is so that you can have leftovers. I love eating Chili the next day. It’s even better after all the flavors have had a chance to marinate together. This freezes well too for a quick supper idea another night. Just pop it int he fridge in the morning to thaw and heat for supper. Feel free to add anything you feel is missing from this recipe and make it your own. You can add spices, extra veggies, anything you want. Use this recipe as a guideline and add what you normally like in chili. I hope you enjoy this recipe as much as we did! I topped mine with sour cream and cheese. We made this in the crockpot but you can make it on the stove top as well. If you are making it in the crock pot; add all ingredients after you brown the beef to the crockpot and cook on low for 4-6 hours. Add onions and peppers to pan and continue to cook for 1-2 minutes. Combine cooked meat, onions, peppers, tomatoes, celery, water, and tomato paste in medium-large pot. Stir spices into pot. Bring to boil, then reduce heat to low-medium and let simmer for 1-2 hours, stirring every 30 minutes or so. I love it! Just made some for dinner and it is really good! Would this be OK to can in a pressure canner? You could pressure can this, but I’ve found the meat gets grainy tasting. It says 1 can tomatoes. What size can? I use a large can (28 oz) of diced tomatoes. It works great. Good luck. We loved it!!! I’m going to bring this to a chili cook-off. Anyone know the nutritional value Per serving? This is so good! I use Rao’s low-carb spaghetti sauce instead of the tomatoes, but the end result is still so tasty! I just made a big batch & ate on it for 3 days! Even my non-Keto, ultra picky, 8 year old loves this. We also add two chopped up zucchinis. Serve over cauliflower rice… Thank you for your recipe. Very good! We had a Chili/Soup feed at church and mine was ALL gone at the end! Any idea of nutritional info per serving? How big is a serving size? 1/2 cup? 1 cup? How many calories does this chili have? Was that for the whole recipe? I’m assuming these are the values for the entire recipe? Good point what size can of tomatoes? Use the big can of tomatoes, I think 28 oz? What serving size did you use? How long would you suggest this in the crock pot? 4 hours on low? How many calories is in this? How many calories is in the recipe.? What is the serving size? Just made this chili tonight and it was absolutely delicious! Made this tonight and my husband and I loved it. I did use 2 lbs of ground beef as I didn’t want half a lb sitting in my fridge. I had mine over a bed of lettuce and we garnished it with avocado and sour cream. I will admit my husband talked me into adding a can of kidney beans, but next time no beans. So so yummy!! !